Ken Hom is known as one of the world’s leading Asian chefs. Passionate about not only using high-quality ingredients in his cooking, but also using performance cookware to maximise the potential of any dish. 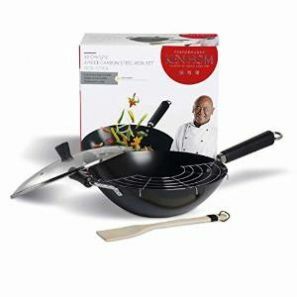 This carbon steel, non-stick wok delivers outstanding performance and durability as well as practical and easy to use. Eco friendly non-stick coating, PFOA free. Induction suitable, metal tool suitable, dishwasher safe.